Seven Beland: How do Stray Cat Carers in Malta and Gozo help Environment and Community? How do Stray Cat Carers in Malta and Gozo help Environment and Community? Travelling in the Maltese Islands, one will soon notice the many feral cats in streets and parks - well-fed and healthy and in top condition. Thanks to more than one thousand persons of all walks of life, their furry co-residents enjoy a pleasant life even though they live outdoors. For the love of animals, stray cat caregivers dedicate quite a lot of time and money to their cat colonies. They feed them daily with proper food, provide veterinary help and neuter males and females as early as possible. How does the work of these devoted volunteers help the environment and the community? A male cat can and will father thousands upon thousands of kittens every year of his life as long as he is not neutered. In ten years a mating pair of cats can, if allowed, have over 70,000 off springs. If it were not for the hard work of the caregivers, the Maltese Islands would be swarmed by starving, mating, stray cats! A colony fed in the same spot every day will not roam a wider area and keeps the males from territorial spraying. The quasi-domestication lets them get used to their local area with less risk of car accidents. Regularly fed strays have no interest in the temptations of garbage bags in the streets. Healthy and neutered feral cats are clean and don't transmit diseases. 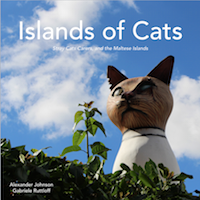 Alexander Johnson and Gabriele Ruttloff of Seven Beland are in the process to write a photo-story book about the widely ignored, quiet work of the stray cat carers in the Maltese Islands - Islands of Cats. Bursting with photographs, this interesting and entertaining book will feature twenty caregivers, their work and stories. The rights to all material and the book will remain with Seven Beland, while costs for translations and the printing are currently being crowdfunded. The campaign on Kickstarter will end March 9. As some of the proceeds will be donated to give much needed aid to the carers. Consider a contribution. Thank you very much for considering your support.